Bigfoot: Remembering Rene Dahinden (1930 - 2001) Richmond, Britich Columbia..
"Something is making those gawdamn tracks!" Or is the mighty mountain mammal a myth? It was exactly as though I had asked them for their views on the unicorn. "The Sasquatch is just not a matter of interest to anthropologists," said Professor Audrey Hawthorn, curator of the University of British Columbia's anthropology museum. "Nobody believes in it, so they're not interested in it." "Most scientist wouldn't give you the time that I'm giving you, they'd just say that sasquatches don't exist and they'd put down the receiver, " said UBC acting head of anthropology Dr. Ken Burridge, who reluctantly gave me ten minutes of his time. " Ninety-nine percent of scientist say it doesn't exist, they believe it's an evolutionary impossibility and therefore won't be caught discussing it." Everyone knows, you see, that the Sasquatch, as James Thurber wrote of the unicorn, is a mythical beast. It exists only in the mental landscape of its supposed beholders. And those who are foolhardy enough to publicly report having seen one or to announce their convictions that sasquatches exist, must naturally be candidates for a psychiatrist's couch. Or are we, as Thurber would say, - counting our boobies before they've hatched? There is no wild glint of fanaticism in the eyes of René Dahinden, veteran investigator of the Sasquatch mystery. But the mere mention of scientists - who, in North America at least, he claims have never seriously examined the evidence for the possible existence of the creature - is enough to make sparks flash in Dahinden's eyes. "'Those clodhoppers!" he blurts out. "Science is the pursuit of the unknown. Now maybe the scientists think there is nothing unknown, since they know it all, and therefore they don't have to pursue it. I don't know, it looks like the scientist get up every morning and pray, 'Please God, let me go through another day without a new thought.' "
We're sitting in the lounge of the Vancouver Gun Club and Dahinden, a weathered muscular gnome of a man who looks like he would be at home in the bush where he has spend so much time tracking the Sasquatch, is about to show me one of the most controversial and, he believes, significant pieces of evidence in the mystery. It is 24 feet of 15 mm color film, allegedly of a real Sasquatch, filmed in October 1967 by the late Roger Patterson, an American rodeo rider and Sasquatch hunter, at Bluff Creek in northern California. René Dahinden and John Green, the former publisher of the Fraser Valley weekly, Agassiz-Harrison Advance and son of Howard Green, Diefenbaker's external affairs minister are two men in North America who have most persistently pursued the Sasquatch. They have checked out hundreds of sighting reports in the Pacific northwest, accumulated a sizable collection of large plaster casts of suspected sasquatch footprints, developed a detailed file of more that a thousand sighting reports dating back a century and reviewed all this in the books: On the Track of the Sasquatch, Year of the Sasquatch and The Sasquatch Files by John Green and "Sasquatch" by Don Hunter and René Dahinden. The composite picture that has emerged is of a bulky, hairy, malodorous subhuman primate averaging six to eight feet in height, 600 - 800 pounds with ape-like head but walking upright like a man and leaving deep human-like footprints 14 to 17 inches long; very shy of human contact. As Dahinden douses the lights, the film flickers abruptly on the screen and a tall, hairy, black creature walking on two legs ambles out of the bush and along the bank of a creek bed. Suddenly there is only a sandy orange green blur of creek bed and trees as the camera jerks swiftly forward. Then, from a closer angle, the camera picks up the creature again, revealing slightly off focus, its pendulous breasts, massive limbs and ape like head with low brow and sloping forehead rising to a crest at the back of the skull. For a few seconds it turns its upper body and looks directly at the camera then without breaking its smooth stride, turns away and continues across the creek bed into the woods. It's obviously phony - just a man in an ape suit is my immediate gut reaction. But then Dahinden puts it through another sequence in slow motion with blow-ups and stop frames, explaining what Hollywood experts had said about how difficult it would be to fake and what biomechanics experts in Britain, Sweden, Switzerland and Russian have pointed out about the creature's walk, when he (fed up with North American Scientists' indifference) brought it to them for analysis back in 1971. When it was all over, the film didn't seem so easy to reject out of hand: it remains an intriguing question mark. It was out of a "sense of adventure" that Dahinden in 1955, two years after arriving in Canada from his native Switzerland, first began tracking the Sasquatch. "I thought at that time I could just go out there and grab him by the rear end and bring him home to mother. And here I am all these years later, still holding out my hand to grab something that may or may not exist. But it's just so bloody fascinating." Dahinden, who refers to himself as a Sasquatch "investigator" has focused his life on proving or disproving their existence. For months each spring he mines spend lead shot from the range at the Vancouver Gun Club where he lives rent free and resells the reclaimed lead shot to the club earning enough for his needs (about $4000) and giving him freedom to check out sightings and spend summers in the bush. Armed with binoculars, movie camera, two 35mm camera and rifle, he and a partner spend a couple of months each summer looking for signs of the elusive creature in some remote region where sightings have been reported. A favorite area has been the rugged, mountainous head of Pitt Lake, 40 miles northeast of Vancouver, an area Dahinden had scoured four times (once for 68 days). So far these trips haven't produced anything, although he has tried everything from putting out scraps of food to (and he laughs over this now) broadcasting monkey screams from a tape recorder into the night air. "You tend to try everything, never knowing if it will work." It was eight o'clock on the sunny Sunday morning and my head was still foggy with sleep when I stumbled to the phone. "How would you like to do a little Sasquatch hunting today?" the voice asked. "I've just had a report of three people seeing something big troubling some cows in a pasture near Bellingham, WA. It was John Green calling from his home in Harrison Hot Springs; I had interviewed him two days earlier. "It looks pretty reliable, there are three witnesses and I'm going down now to check it out." It was with a mixture of curiosity and skepticism that I headed down the freeway to Bellingham, about 50 miles south in Washington State, where I met the group at the home of a local Sasquatch buff. Green, a tall bony quiet spoken man asked questions from a special form. Jim Watts, a mill worker said he had picked up his son Jim Watts and Mark Engels from a farm where they were working and was binging them home along the Mount Baker highway late Wednesday afternoon of that week, when Engels suddenly for excited about something big and hairy he saw in a pasture 200 yards off the road. Engels: "The cows were just going dingy. They were all jumping around twisting their heads and staring at something over on the other side of the fence. That is when I just saw it standing there still." Watts Sr: "The first time we went by Mark saw it, then I came back on the other side and saw it on the way. Then we made a third pass going back and I parked on the right-and side of the road and at that time we saw the majority of it." Watts Jr: "It just towered above the cows quite a ways. He seemed kind of heavy-set in the shoulders and in the stomach and lower hips. It was just like a black blob." Engels: "You could see shoes on a guy from that distance but there was none. It was all one black object. So I figure it's no guy. It was just standing there at first, then it walked away to the next bunch of woods, a casual, slouchy walk like it owned the land." We checked out the fields but there were no signs. It had rained since and the muddy sections were chewed up with cow tracks. But the three witnesses were convincing: they either saw what they said they saw, or they were consummate actors. "That was pretty much an average report" said Green. People swear they saw something, but there is no hard evidence." The files in Green's cluttered study continue to grow with reports of sightings and footprints periodically coming in from all over North America (though most frequently from British Columbia, Washington, Oregon and California.) They extend back more than a century and run the gamut from the routine to the bizarre. On July 4, 1884, the Victoria Colonist ran a factual account of the capture near Yale, British Columbia of what Sasquatch buffs regard as a young Sasquatch, a four foot seven inch 127 pound hair man ape that was promptly dubbed "Jacko." Some believed Jacko died on its way to an English circus. In 1924, a logger Albert Ostman was supposedly kidnapped, so he claimed in 1958, by four sasquatches near Toba Inlet British Columbia and held for a week only escaping in the confusion when one swallowed a tin of Ostman's snuff. In 1941 a woman fled her house at Ruby Creek, British Columbia when she saw a tall hairy man like creature stride across her field into her shed and help himself to some sat salmon. In 1958 workers pushing a road through the Bluff Creek Valley of northern California came upon a series of giant deeply embedded footprints. In March 1973, three herring fishermen returned to Vancouver excited with seeing a bulky tall, grey creature walking on the beach in Bute Inlet. And last summer (1974) a director of a youth camp at the head of Harrison Lake, 100 miles north east of Vancouver, was sitting by the campfire when an eight foot tall hairy creature appeared at the edge of camp sniffing the night air, then crashed away through the bush when startled by boys with flashlights. John Green's fascination with the phenomenon began in the heady days of British Columbia's 1957 Centennial when the town of Harrison Hot Springs, 75 miles east of Vancouver decided to sponsor a Sasquatch hunt to celebrate the centennial. Because of the publicity Green, as publisher of the local weekly, came in contact with what he regarded as reliable eyewitness accounts of sasquatch sightings. In checking out some reports, the footprints hooked him. It was December, 1969, that the most significant set of such footprints was discovered, following some apparent sightings at Bossburg, WA., forty miles south of the Canadian Border in eastern Washington. Green, Dahinden and some American Sasquatch buffs raced to the scene and found 1,089 huge footprints frozen in snow. The footprints meandered through some farmland by Roosevelt Lake. What was significant about the Bossburg tracks was apparently a cripple. The right footprint was deformed. It was a clubfoot. This anomaly has become a key point with the few scientists who have seriously examined the Sasquatch phenomenon. "These footprints were the ones that changed me from a doubter to an accepter." said Dr. Grover Krantz, professor of anthropology at Washington State University in Pullman, Washington... "I have now examined a lot of evidence that I can't account for any other way. I'm quite satisfied that sasquatches do exist." Dr. Krantz, an expert on human evolution, Dr. John Napier, director of primate biology, Birkbeck College, University of London, author of "Bigfoot" and a clutch of Soviet scientists to whom Dahinden presented the Sasquatch evidence four years ago are apparently the only scientists y et to regard the phenomenon worthy of serious analysis. Over the years, Green and Dahinden have presented the evidence to major Canadian and U.S., Universities and scientific institutions, and the reaction, they say, has ranged from condescending to contemptuous. Without evidence of bones or body, the North American scientists still consign the Sasquatch to the realm of folklore. "There have been far more sightings of the animal that footprints, which is the reverse of bears. You find more tracks than you see bears and this is true of other animals," said Dr. Wayne Suttles, Professor of Cultural Anthropology at Portland State College in Oregon. "This I think means many of these sightings are illusions, imagined and are from people deceiving themselves." Hallucinations and hoaxes - these are the common explanations offered by the scientific community. The Patterson film in partricular, has been almost universally rejected by scientists as fake, although no proof of this has even been established - no man in the fur suit has been discovered. Follow his analysis of the film, Dr. Dmitri Donskoy, chief of the chair of biomechanics at the USSR Central Institute of Physical Culture in Moscow, reported to Dahinden that the creature did not walk like a man but with the fluidity of a massive, bulky animal. Dr. Don Grieve, reader in biomechanics at London's Royal Free Hospital, analyzed the creature's movements on the film and concluded that it depended on what speed it was shot. If it was filmed at 16 frames per second, it walked like a man, but if it was taken at 245 frames per second, it did not walk like a man. No one knows precisely what speed it was shot at. "If it is a fake," Dr. Grieve pointed out, "it is an extremely clever fake." There have been hoaxes pulled of course, by practical jokers and people out to make a few dollars. Some footprints were faked in Washington and California; a Washington game guide, Ivan Marx faked two movies of a Sasquatch (one a year after the discovery of the Bossburg cripple tracks and not too far away) but they were exposed relatively easily. Yet there have been so many sighting reports and footprints that they can't all be the work of hoaxers. According to Dr. Krantz, the tracks are to complex in many instances to be able to be made by hoaxers. The lengths of stride often surpass what a man could do; depths of imprints up to three inches would require the addition of hundreds of pounds of weight. There is evidence of independent toe movement, the shape of the footprint with enlarged heel and shortened front foot, indicates a foot perfectly adapted to man weight over 500 pounds. But the clincher (and Doctors Krantz and Napier are in agreement on this) is the cripple footprints found at Bossburg which would take "a super genius" to have faked. "It is very difficult," wrote Napier in his Bigfoot book "to conceive of a hoaxer so subtle, so knowledgeable and so sick that could deliberately fake footprints of this nature." While Dr. Napier agreed in his book, which is the most comprehensive review of the Sasquatch phenomenon, with the opinion of most scientists that the lack of bones or a body seriously weakens the case for the Sasquatch, he nonetheless found that with all the other evidence there was only one convincing explanation for the footprints. "I am convinced that the Sasquatch exists, but whether it is all that it is cracked up to be is another matter altogether. There is something in North America that needs explaining and that something leaves manlike footprints. The evidence I have adduced in favor of the reality of the Sasquatch is not hard evidence; few physicists, biologist or chemists would accept it, but nevertheless it is evidence and cannot be ignored." But it is being ignored. Dahinden and Green believe what is needed is for scientists to launch a major multi-disciplinary study of the Sasquatch phenomenon, but North American Scientists remain as indifferent as ever. So René Dahinden plans to sail up the coast this summer to carry on the search around Bella Coola, about 250 miles north of Vancouver. Neither he nor John Green, after many decades of ridicule and rebuffs is giving up. The mystery of the Sasquatch is too fascinating to give up. It is not, they say, a matter of being fanatical believers in the Sasquatch! " "Let's get this business about belief straight," Green declared. "The believers are the scientists, they're the ones who are clinging to a belief. The people who think that there are Sasquatches are the ones who are investigating - the ones who have become convinced on evidence. The scientists are the ones going on pure faith and don't actually know much about it and make darn sure they don't know anything about it." This article was generously sent to me mid-2000 from the files of the late René Dahinden. The newspaper clipping was so yellowed, tattered, and worn and published in such tiny font that I was unable to scan to text. This has been word processed the old fashioned way, by hand for your perusal. Hope you enjoy "..the way it was." 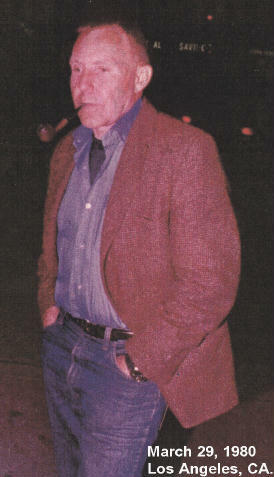 Bobbie Short, August 23, 2001 -"Remembering René"